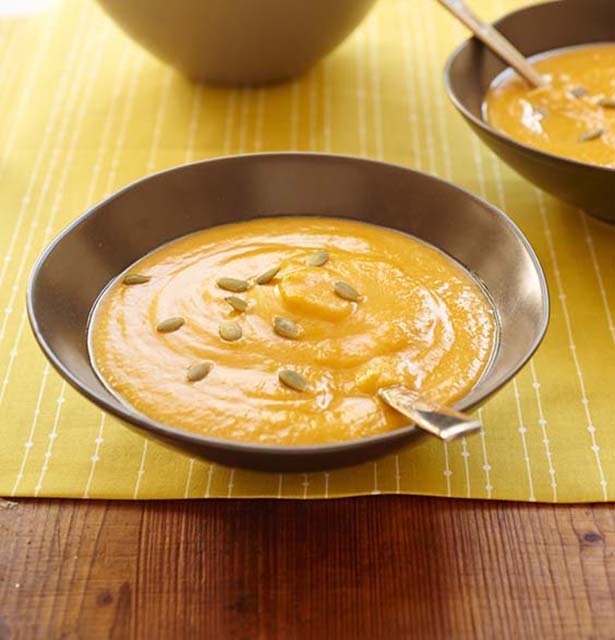 Make a festive soup for the holiday season with roasted and pureed butternut squash. Garnish with smoked paprika and roasted squash seeds for a special touch. Cut off ends of squash, quarter, remove seeds and stringy pulp (save the seeds and roast them). Place in lightly-greased baking dish. Roast at 350˚ for one hour or until tender. Allow to cool then scoop out squash. Set aside. Heat oil in heavy-bottomed stock pot over medium heat. Add onion and garlic to stock pot and sauté about 3 to 5 minutes until onions are tender and translucent. Stir in butternut squash. Add chicken broth, paprika, and cayenne. Use sea salt to taste. Reduce heat and simmer 15 to 20 minutes. Stir in sage and milk. Cook until heated. Puree with immersion blender. Taste and adjust seasoning as desired. Serve warm. Garnish with roasted squash seeds, if desired.